Let's get the Batman 3 stuff out of the way. Nolan has settled on a concept for the third film. Warner Brothers have okayed the idea and currently have two writers penning the script. Nolan's brother and recurring collaborator Jonathan Nolan is working with David Goyer on the next installment. Both Goyer and Jonathan co-wrote Batman Begins and The Dark Knight. No timeline has been set, but one can assume that the next Batman will be Nolan's next project. On to the Man of Steel. 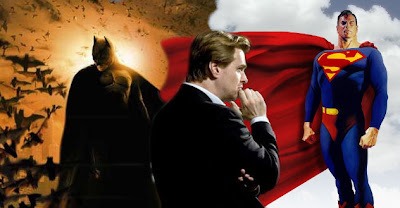 Word is that Christopher Nolan will not direct or write the next Superman, but will "godfather" the project. What exactly does that mean? It means he will be over-seeing the project and making sure that the next Superman is a completely fresh franchise. The knee-jerk reaction to this news is that Warner Brothers wants to take a darker approach to Superman, but the level-headed reactions says this decision pushes for sophistication. When you look back on the Batman films previous to Christopher Nolan's direction, it becomes fairly clear what decisions were made to ground the story in reality. All of the gloss and camp was removed. Here with Superman the changes are a bit different. The original Superman movies have a thin line between camp and reality. For example, Superman himself is anything but realistic. He's an alien from a distant planet with outrageous powers and a outlandish costume. The world that Superman resides within however, has always remained realistic. He fights natural disasters, saves kittens from trees and does not battle other unbelievable foes. Granted the original films do have a campy overtone, but so did a majority of the dramatic films of the era. Reversely, Gotham until Nolan never felt like a real city and Batman's villains were by far some of the most outlandish characters put to screen. Looking specifically at Singer's Superman Returns, the question becomes what exactly does WB intend to change? Singer gave fans a more adult version of Superman. His film was very much a homage to Donner's original film, but felt far more serious than the (at times) campy prior films. Singer did keep a stylized look to Metropolis, but it remains a grounded and contemplative vision. There is plenty of debate to be had on how WB and Nolan should approach the next Superman movie, but the resounding impact I'm getting from this news is smart money. Nolan has to date done a great job of keep his Batman films on a smaller budget. Not spending more than $190 million on either film. The return was obviously huge for both. Reversely, Singer's Superman Returns cost a $270 million and never turned a profit that impressed the studio. Look for Christopher Nolan to be a watchdog of sorts, who can help steer the Man of Steel in the right direction both in vision and budget.